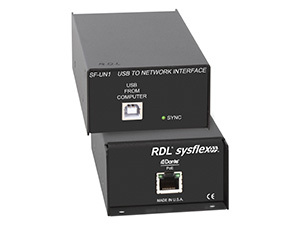 SysFlex by RDL is the industry’s best value when it comes to complex interface solutions. 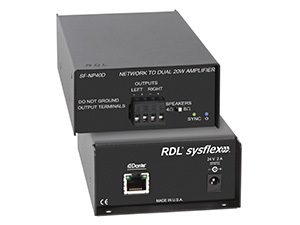 SysFlex modules provide connectorized interface between data networks and analog and digital audio devices, networked and conventional amplifiers and other application-specific solutions. The SF-BNC2 is a bidirectional Dante audio network interface. It features two unbalanced audio inputs (left and right) on RCA or stereo 3.5 mm Mini-jack connectors, as well as two unbalanced audio outputs (left and right) on RCA and stereo 3.5 mm Mini-jack connectors. Special software is not required to configure the SF-BNC2. 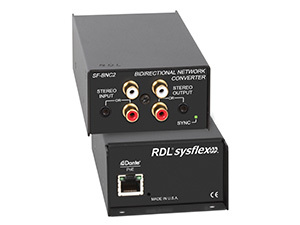 Each input provides a network digital audio level of -20 dBFS for an unbalanced -10 dBV input. Each output provides -10 dBV unbalanced for a network digital audio level of -20 dBFS. The SF-BNC2 is a professional grade product for studio quality fidelity and low noise performance. 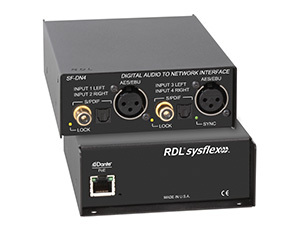 The SF-DN4 is a digital audio interface that converts two stereo digital audio sources to four Dante network audio channels. The SF-DN4 automatically detects a valid input on any of the three input jacks: S/PDIF optical, S/PDIF coaxial, or AES/EBU XLR. The input is decoded, re-clocked and transmitted to the Dante network. A yellow front-panel LOCK LED indicates a valid source received without any lock errors. Special software is not required to configure the module. The SF-DN4 is a professional grade product for studio quality performance. 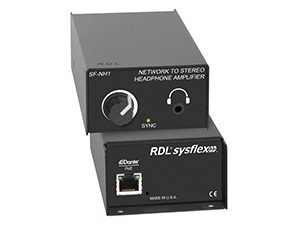 The SF-ND2 is a digital audio interface that converts two Dante network audio channels to a stereo digital audio output. The output is switch-selectable to provide an AES/EBU on XLR, or coaxial and optical S/PDIF. The switch enables the appropriate output jack and any required electrical and data format conversion. Special software is not required to configure the module. The SF-ND2 is a professional grade product for studio quality performance. The SF-NH1 is a headphone amplifier that converts two Dante network audio channels to a stereo headphone output with front-panel level adjustment. The output connects through a stereo 3.5 mm Mini-jack. Each channel provides 100 mW into 100 ohms for a network digital audio level of 0 dBFS. Special software is not required to configure the module. The SF-NH1 is a professional grade product for studio quality fidelity and low noise performance. 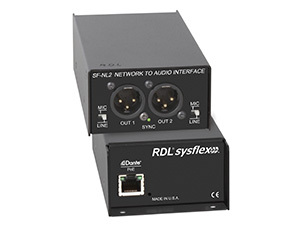 The SF-NL2 is a line-level interface that converts two Dante network audio channels to two balanced audio outputs on XLR connectors. Each channel provides +4 dBu balanced for a network digital audio level of -20 dBFS. Each output is equipped with a selector to set the output to line level or attenuate the output by 50 dB to mic level. Special software is not required to configure the module. The SF-NL2 is a professional grade product for studio quality fidelity and low noise performance. The SF-UN1 is a digital audio interface that converts a USB stereo digital audio source to two Dante network audio channels. The SF-UN1 automatically detects a valid USB input. The input is decoded, re-clocked and transmitted to the Dante network. The module provides automatic sample rate conversion from the USB input to the Dante network. Special software is not required to configure the module. The SF-UN1 is a professional grade product for studio quality performance. 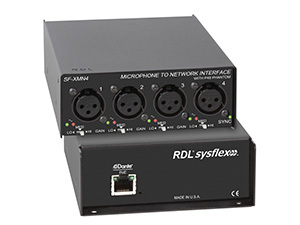 The SF-XMN4 is an interface that converts four XLR microphone inputs to Dante network audio channels. Special software is not required to configure the SF-XMN4. Each XLR input is equipped with a switch to set the gain for dynamic or condenser microphones. A dual-LED VU meter displays the level for each input to facilitate selection of the ideal gain range. P48 phantom voltage is supplied to each microphone input. The SF-XMN4 is a professional grade product with discrete mic preamplifiers for studio quality fidelity and low noise performance.